Perfect for filling in awkward spots and gaps, under trees, around edges of borders and patios or to fill empty pots. These fab new little groundcover roses really are so versatile and easy to grow. 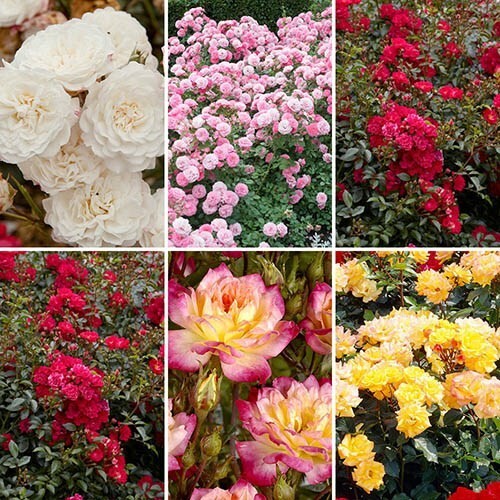 They are 'Multiflora' roses which will produce hundreds of smaller flowers in summer and autumn. Tried and tested in commercial landscape plantings where they get almost no maintenance or help, they form neat mounds of flowers, and have good disease resistance, so really are easy care. Supplied as established plants in 9cm pots, well-branched, ready to plant all year round. These are a great little collection to fill those awkward spots most gardens have. Tolerating quite a bit of shade (or full sun), as well as most types of soils, these fab new little groundcover roses really are so versatile and easy to grow. Supplied as a set of 6 established plants in 9cm pots, well-branched, they can be planted out any week of the year you can get a spade in the ground.